In today’s edition of Take One the ‘rock room’ examines a rare non-LP ‘B’ side released by the Doors as a single in March of 1969 in support of the album The Soft Parade. The full length album release itself was met with mixed reviews, as some fans and critics did not know what to make of the golden horns that dressed up the normally cloaked psychedelic songs the group was famous for. While the first song recorded for the LP was Morrison’s ‘Wild Child’, consistent with the Doors sound, the album soon took on a life of its own due to the fact Morrison was running out of songs after riding the cresting waves of fame for two years. Taking direction and influence from contemporaries such as The Band, Blood, Sweat and Tears and the soon to be famous Chicago Transit Authority, the Doors foray into orchestrated rock was met with varying degrees of success. Swelling strings and silvery streaks of horns softened the edges of the normally edgy lysergic mantras disseminated by the band. The focus of this rant, ‘Who Scared You’, is in my opinion is the greatest example of the group’s combination of horns and sparse Shamanistic grooves. The result is a funky Morrison composition containing all of the Doors notable instrumental hallmarks but punctuated with well placed horns and double entendre Morrison lyrics that straddle the philosophical and the sexual. Prior to The Soft Parade’s release the band prepped their audience for their change in musical direction by releasing the Robbie Krieger composition ‘Touch Me’ which went on to become one of the band’s biggest hits. ‘Wishful Sinful’ followed, giving Krieger another ‘A’ side which in this case only enjoyed moderate success. This tectonic shift in the dynamics of the band unfortunately signaled Morrison’s slow lost of interest in the world of rock and his creative focus morphing into poetry as opposed to song lyrics. 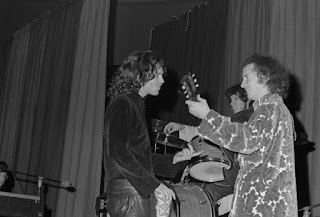 Morrison’s personal frustrations would also boil over on the live concert stage prior to the release of The Soft Parade and culminating with the famous Miami incident. While Morrison’s insane behavior and alleged exposure rightfully received most of the focus, what I also noted was his flippant attitude toward the performances of The Soft Parade material. 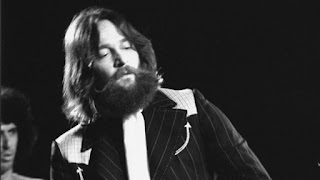 The combination of Morrison’s addictions, his difficulty with record company politics, stardom as well as not being able to keep up with the composing prowess of Kreiger all contributed to an album light on Morrison contributions, singles with a more mainstream lean and a band staring to lose their directive. Obviously the exception to this is the LP closing opus ‘The Soft Parade’, but that needs its own focused rant to fully uncover its clandestine gifts. 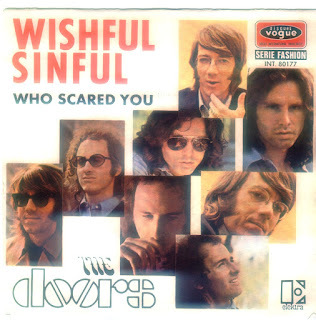 ‘Who Scared You’ also holds the distinction of being one of only three non-album songs that the Doors ever released. The others being ‘You Need Meat (Don’t Go No Further) a Willie Dixon track placed as the flip to ‘Love Her Madly’ in 1971 and the post-Morrison song ‘Tree Trunk’ which was the ‘B’ side to 1972’s single ‘Get Up and Dance’. ‘Who Scared You’ would eventually see deserving wide spread release on the 1972 compilation LP ‘Weird Scenes Inside the Gold Mine’ and later on the 1999 release Essential Rarities. 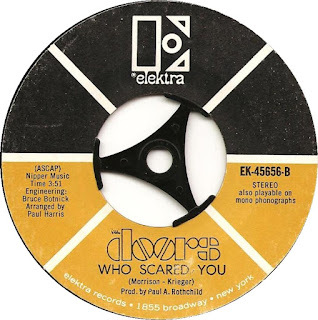 Examined now in the grand context of the band’s catalog ‘Who Scared You’ would have fit nicely on The Soft Parade, perhaps even to displace lighter fare such as Krieger’s ‘Running Blue’ or the Morrison and Krieger composition ‘Do It’. ‘Who Scared You’ tumbles in on tribal tom-tom’s and Manzarek’s quintessential whistling bird of prey keys. The rhythm climbs a set of hollow steps and flops excitedly on the edge of the bed with a snare snap. Kreiger slithers in with his clean Gibson SG tone that curls like a plush spring, coiled to work against the carefully shifting groove. The song contains a deviating groove that is as specific to the Doors as a fingerprint, accentuated by breathy horns that tastefully colored specific moments of note. Mid-song the band breaks down into a syncopated carnival beat increased Morrison’s slightly of mic ‘Ugh’s ‘ that punctuate the sexuality of the song in perfect time with Manzarek’s cascading runs down the black and whites of his organ. Following the musical representation of consummation, the song returns to the glissading arrangement as Morrison asks the subject not to leave because he knows that they have both been satisfied. Typical of Morrison’s compositions the content lounges in both sun and shade while straddling the line between truth and illusion. As the song reaches its conclusion Morrison pulls his blues man persona from the sack of silver and gold on his waist noting he sees the unidentified ‘rider’ coming down the dusty road, carrying his heavy load. The track concludes and the listener feels satisfied due to the inclusion of every element you would want to hear in a Doors track; mystery, lust, rhythm, light and shade. ‘Who Scared You’ would also make it to the concert stage for a couple of rare appearances, once in December of 1968 at the L.A. Forum and also at the band’s famed January 1969 appearance at Madison Square Garden where they were joined by horns and a string quartet. According to these available recordings the song translated well to the stage.While there may be other versions that were performed and that exist they are still lost to time as of the writing of this article. 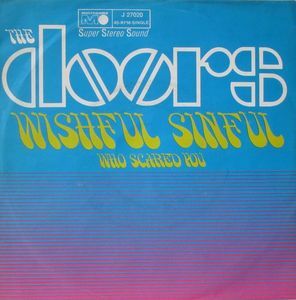 ‘Who Scared You’ in the ‘rock room’s’ humble opinion is the most successful song from The Soft Parade era to combine the essential organic Doors elements with lush string and horn orchestrated brush strokes. While certain tracks may get more critical acclaim, ‘Who Scared You’ may be the track that deserves the notice. While the song’s release as a ‘B’ side illustrates the band was aware of the song’s strengths, its inclusion on a single left it off of the album while also insuring the track would eventually reach ‘rarity’ status. While there are no secrets left in the Doors catalog to be discovered, thankfully there are still a few tracks left that still classify as ‘deep’ cuts for fans new and old to enjoy.